China is making great strides toward its goal of a permanent space station and further exploration of the moon and Mars after successfully launching a new generation carrier rocket from a new spaceport over the weekend. A re-entry module that was aboard the new Long March-7 rocket touched down successfully on Sunday afternoon in North China's Inner Mongolia Autonomous Region. On Saturday, the rocket blasted off from the Wenchang Satellite Launch Center in South China's Hainan Province. The Long March-7 mission was the first launch from Wenchang, the fourth launch site in China. It is expected that the 53-meter, 597-ton Long March-7 will become the workhorse for China's space missions. Its main role in the future will be to transport the cargo vessel, the Tianzhou-1, to China's planned space stations, due to enter service around 2022, as well as satellites and other spacecraft. "Superseding the older generation of the Long March-2, 3 and 4 rockets by around 2021, the Long March-7 will take some 80 percent of all transportation tasks," Pang Zhihao, a research fellow at the Chinese Academy of Space Technology, told the Global Times. The Long March-7 is a medium-sized, two-stage rocket that can carry up to 13.5 tons of payload to low-Earth orbit. The use of kerosene and liquid oxygen as fuel, rather than the highly toxic propellants used by earlier rockets, differentiates the Long March-7 from the old generation, increasing its payload capacity by some 60 percent while making it more environmentally friendly and less expensive, Pang said. "China will have independently built the second space station to be put into orbit since the end of the Cold War. China has drawn international cooperation from Europe, after the overbearing US refused to share core technology with its partners," a Beijing-based scientist and expert on manned space flight, who asked for anonymity, told the Global Times Wednesday. With its mature unmanned spacecraft technology with proprietary intellectual property rights, China has made greater headway in space exploration than Europe and Japan, which depends on Russia and the US, Pang noted. The new spaceport will play a significant role in launching large space stations and deep-space probes, in addition to satellites, low- and medium-earth orbit spacecraft. "Wenchang's location, being much closer to the equator than the other three [Chinese spaceports], could considerably save fuel, especially for rockets of great payload capacity like the Long March-5 and 7," the anonymous space expert said. Among the other three, the Jiuquan Satellite Launch Center in the Gobi Desert in Northwest China's Gansu Province is currently the nation's only manned spacecraft launch center, while Xichang in Southwest China's Sichuan Province is mainly used to launch powerful-thrust rockets and geostationary satellites. The third, Taiyuan Satellite Launch Center in North China's Shanxi Province, is capable of launching satellites into both medium and low orbits. Another benefit of the coastal center is that rockets measuring over 3.5 meters in diameter can be transported to the center by sea, since these can't be transported by rail, the anonymous expert said, citing the Long March-5, which measures five meters in diameter, as an example. The debut of the Long March-7, along with the planned maiden flight of the country's largest carrier rocket Long March-5 later this year, will usher in a new generation of China's carrier rockets crucial for lunar exploration and construction of permanent space stations. The Long March-5 will also make its maiden flight in the latter half of this year from Wenchang, said Wang Jingzhong, a senior official with the Xichang Satellite Launch Center, at a press conference Saturday after the successful launch. The Long March-5 has a liftoff weight of 869 tons, and a payload capacity of 25 tons to the low Earth orbit and 14 tons to the geostationary transfer orbit. If the launch is successful, this will likely determine the later progress of China's lunar exploration and space station construction, Pang said. It is scheduled to carry the Chang'e-5 lunar probe around 2017 and will be used to launch China's planned space station modules and Mars probes. China will send its second orbiting space lab Tiangong-2 into space in mid-September. The Shenzhou-11 manned spacecraft will be launched later in mid-October to dock with the lab with two astronauts on board, said Wu Ping, deputy director of the manned space engineering office, at the press conference. 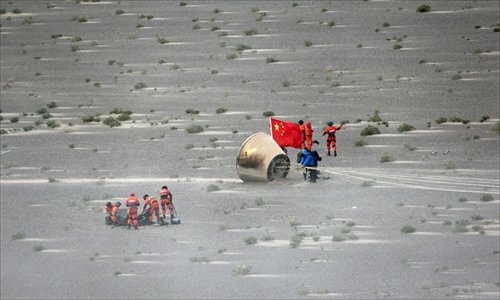 The two astronauts have been chosen and are currently under intense training, Wu said.